The other time, I talked about moisturizing your skin and what kind of moisturizer would best fit a specific skin type. Now, I would want to share one of the moisturizers I have been using for quite some time now. And, a lot of you know that one of the skin care products I trust dearly is the Celeteque line so why not use one of the brand's products to take care and moisturize my skin, right? 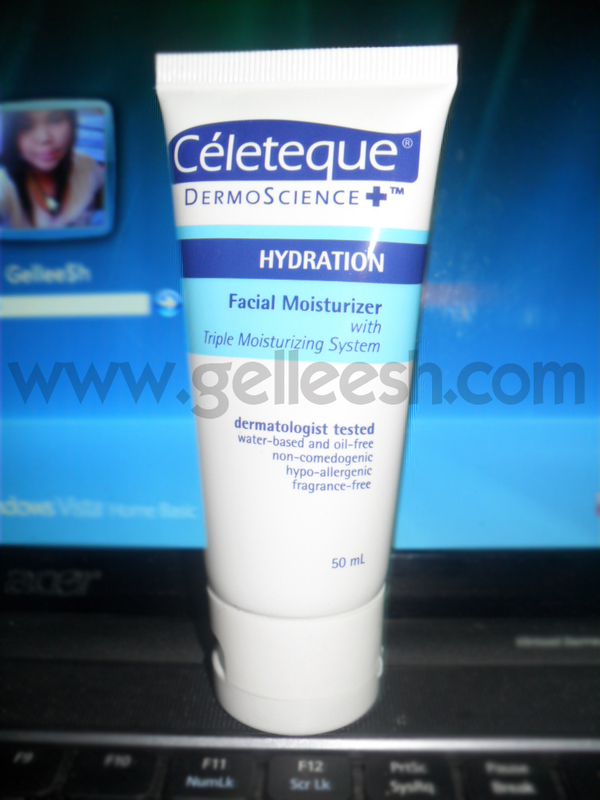 As I was browsing through the skin care products shelf in the grocery and looking for an anti-aging moisturizer for my grandma, I spotted the Celeteque DermoScience+ Hydration Facial Moisturizer and decided to give it a try. The product claims that it has a unique hydrogel formulation that provides the skin with optimum hydration without the greasy after-feel. As you can see in its packaging it also claims on having a triple moisturizing system. So what is it about? It's because it contains Glycerin, Pro-Vitamin B5 and Aloe Vera which work deep down your skin to provide you with lasting relief from skin dryness. It has Dimethicone which seals in the skin's moisture leaving your skin soft and smooth. First of all, the packaging is very convenient plus for a 50ML product costing P127, it's very reasonable. Upon application to your skin, it gets easily absorbed, thus it won't leave you feeling sticky and greasy. It doesn't have a scent so it's a thumbs up, definitely. It really keeps my skin moisturized since I have been using an acne cleansing gel for my zits and the tendency when you use products for your acne is that it may leave your skin dry. So, this product is definitely perfect for me. First of all, it doesn't have an SPF content so I use this in the evening. Oh, and Celeteque products may be to strong for people with sensitive skin so make it a habit to consult your dermatologist first before trying this out or any other products you are unsure of. I really don't mind using a different product in the morning to moisturize my skin that is why I'm sure to purchase this again. It's inexpensive and effective. Partnered with the Celeteque Exfoliating Facial Wash and Acne Cleansing Gel, it works really well. I'm giving this a rating of 8/10. ohh great review!! i'll have to see if i can find this in germany :)! Re: SPF, they do have a variant with SPF but it's pretty low. thanks for sharing sis! Happy hearts day! !